Back in 2015, automaker Tesla Motors set its sights on the home energy storage market and announced the launch of its home battery product, the Tesla Powerwall. In the past, Tesla Motors has been praised for making high-quality electric vehicles, as well as for their ability to reimagine and successfully rebrand existing technologies. In fact, while Tesla's automobiles revitalized the 21st-century electric vehicle market, the first electric cars were invented more than a hundred years earlier. Tesla’s rebranding of residential-use batteries is in line with their legacy of reimagining existing products. Tesla's battery may represent the first time in history that everyday homeowners are truly excited about the potential of storing energy at their home. The Powerwall, combined with the exciting Tesla Solar Roof, are both potential cornerstones of Elon Musk's sustainable energy vision for the future. Tesla describes the Powerwall as a “rechargeable lithium ion battery with liquid thermal control.” It is one of a few companies in the residential energy storage market that makes small-scale batteries for home energy storage. The first-generation Powerwall launched in April 2015, and an updated Powerwall 2.0 was announced in October 2016. Prior to April 2018, the price of a Powerwall 2.0 battery (not including installation costs) was $5,500. It has since increased to $6,700. Tesla battery packs are an ideal pairing for solar panel systems, especially in the case of off-grid projects where homeowners need or want to become fully independent of their utility. A solar storage solution like the Tesla Powerwall allows you to maintain a sustained power supply during the day or night. But how does Tesla’s battery pack measure up against all the other home energy storage options? Read on to learn more about Tesla Powerwall’s cost, technology, and warranty coverage. The list price for a new Tesla Powerwall 2.0 battery, which offers twice the storage capacity of the original Powerwall, is $6,700. Supporting hardware adds another $1,100 to the equipment costs, bringing the total to $7,800. Installation can add anywhere from $2,000 to $8,000 to the final bill. 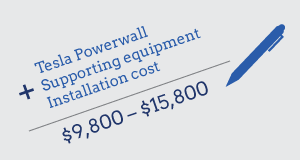 It is important to note that the list prices you see don't include the cost of installing your Powerwall on your property. Tesla estimates that installation will add $800 to $2,000 to your bill. However, this estimate doesn't include the cost of electrical upgrades, taxes, permit fees, or connection charges. EnergySage users have reported installation costs that add anywhere from $5,000 to $8,000 (before any financial incentives are applied). The final number will be dependent on the specifics of your installation. If you want to install the Powerwall as part of a solar-plus-storage system, battery costs are just one part of the equation. An average 5 kilowatt (kW) solar energy system costs anywhere from $8,500 to $16,000 depending on where you live and the type of equipment you choose. That may sound like a lot of money, but installing a solar-plus-storage system can be a worthwhile investment. Solar battery economics depend on a few different factors. Whether or not the Tesla battery pack makes sense for you depends on the way that your electric utility structures its rates, as well as your reasons for installing a solar battery. How does Tesla's battery work? Tesla and other electric carmakers have invested a significant amount of time and money into developing long-lasting battery technology. An enduring concern of American car buyers is that electric vehicles don't hold enough charge, and that they could be left stranded along the roadside as a result. While Tesla’s research into battery technology was initially focused on the auto market, manufacturing a Tesla battery pack for home use is another way for the company to bring its existing inventions to market. As with other energy storage products, the Tesla battery pack is sized for day-to-day use at your home, and is usually paired with a home solar panel system. When your solar panels produce more electricity than you can use in your home, the excess is stored in the battery pack instead of being sent back into the electric grid. Later, when your panels aren’t producing enough electricity, you can use the electricity stored in your Powerwall instead of having to buy it from your utility. Normally, this process happens over the course of a day: when the sun is high in the sky and your solar panels are producing more electricity than you can use, the surplus energy is stored in your Tesla Battery. As the sun goes down and your solar panel production decreases, you draw on the electricity that you stored during the sunniest part of the day. Essentially, the Powerwall helps you balance out your electricity production and usage over the course of the day. Can you go "off the grid" with a Tesla Powerwall and solar? Installing a solar-plus-storage system at your home is a great way to take control of your electricity bill, but it doesn’t mean that you’re completely disconnected from your utility. Going "off the grid" with solar batteries is actually a more expensive and complicated proposition than you might think. A single Tesla home battery will only provide backup power for a few hours – not nearly enough to cover you if you have an entirely cloudy day, let alone several days or weeks of inclement weather. What is the Tesla Powerwall warranty, and how long does the battery last? The Powerwall comes with an unlimited 10-year warranty that assumes your battery is used for daily charging and draining. This warranty includes a capacity warranty that guarantees your Powerwall will retain at least 70 percent of its capacity to hold a charge during this time. Tesla’s battery technology is similar to other rechargeable batteries both large and small: as time goes on, the battery loses some of its ability to hold a charge. Think of how the battery life of a brand-new smartphone compares to one that is a few years old. As you continually charge and drain your phone’s battery, it starts to lose some of its ability to hold a charge. Tesla battery life will deteriorate in the same way. That isn’t an indicator of a product flaw – all batteries lose some of their ability to hold a charge over time, whether it’s an electric vehicle battery, a home energy battery, or a rechargeable AA battery. This is why Tesla offers a warranty that guarantees a certain amount of storage capacity. While the warranty isn’t the only criterion to evaluate when choosing a solar battery for your home, it should be one factor under consideration when making an investment in solar-plus-storage. Should you install a Tesla Powerwall or other solar battery? Solar batteries are a fairly new technology for homeowners. While they offer significant benefits for some, they aren’t always a necessary investment. If your utility offers net metering, installing a solar battery won’t save you money. However, if you install a solar panel system in an area with time-of-use (TOU) electricity rates, no net metering, or significant demand charges, a solar battery could be a good choice for you. 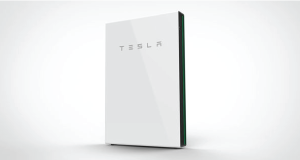 The Tesla Powerwall battery is currently available through the company's certified installer network in the U.S. Whether you want to install a Tesla Powerwall or other home battery pack, you will most likely need to work through a certified installer. Adding energy storage technology to your home is a complicated process that requires electrical expertise, certifications, and knowledge of the best practices required to install a solar-plus-storage system correctly. A qualified EnergySage-approved company can give you the best recommendation about the Tesla home battery and other energy storage options available to homeowners today. If you are interested in receiving competing installation quotes for solar and energy storage options from local installers near you, simply join the EnergySage Solar Marketplace today and indicate what products you’re interested in your profile’s preferences section. As with any big ticket purchase, shopping for a solar panel installation takes a lot of research and consideration, including a thorough review of the companies in your area. A recent report by the U.S. Department of Energy’s National Renewable Energy Laboratory (NREL) recommended that consumers compare as many solar options as possible to avoid paying inflated prices offered by the large installers in the solar industry. To find the smaller contractors that typically offer lower prices, you'll need to use an installer network like EnergySage. You can receive free quotes from vetted installers local to you when you register your property on our Solar Marketplace – homeowners who get 3 or more quotes can save thousands on their solar panel installation. The bigger isn't always better mantra is one of the main reasons we strongly encourage homeowners to consider all of their solar options, not just the brands large enough to pay for the most advertising. A recent report by the U.S. government found that large installers are $2,000 to $5,000 more expensive than small solar companies. If you have offers from some of the big installers in solar, make sure you compare those bids with quotes from local installers to ensure you don't overpay for solar. National-scale installers don’t just offer higher prices – they also tend to have fewer solar equipment options, which can have a significant impact on your system’s electricity production. By collecting a diverse array of solar bids, you can compare costs and savings based on the different equipment packages available to you. There are multiple variables to consider when seeking out the best solar panels on the market. While certain panels will have higher efficiency ratings than others, investing in top-of-the-line solar equipment doesn’t always result in higher savings. The only way to find the “sweet spot” for your property is to evaluate quotes with varying equipment and financing offers. Should you install a solar battery for home use?